Æthelstan presenting a book to St Cuthbert. Illustration in a manuscript of Bede's Life of Saint Cuthbert presented by Æthelstan to the saint's shrine in Chester-le-Street, the earliest surviving portrait of an English king. He wore a crown of the same design on his "crowned bust" coins. 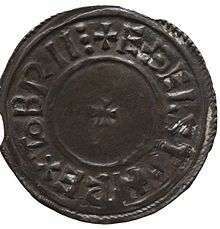 Æthelstan or Athelstan (Old English: Æþelstan[lower-alpha 1], Æðelstān[lower-alpha 2], meaning "noble stone"; c. 894 – 27 October 939) was King of the Anglo-Saxons from 924 to 927 and King of the English from 927 to 939. [lower-alpha 3] He was the son of King Edward the Elder and his first wife, Ecgwynn. Modern historians regard him as the first King of England and one of the greatest Anglo-Saxon kings. He never married, and was succeeded by his half-brother, Edmund. When Edward died in July 924, Æthelstan was accepted by the Mercians as king. 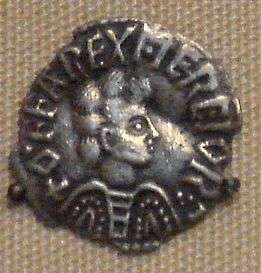 His half-brother Ælfweard may have been recognised as king in Wessex, but died within three weeks of their father's death. Æthelstan still encountered resistance in Wessex for several months, and was not crowned until September 925. In 927 he conquered the last remaining Viking kingdom, York, making him the first Anglo-Saxon ruler of the whole of England. In 934 he invaded Scotland and forced Constantine II to submit to him, but Æthelstan's rule was resented by the Scots and Vikings, and in 937 they invaded England. Æthelstan defeated them at the Battle of Brunanburh, a victory which gave him great prestige both in the British Isles and on the Continent. After his death in 939 the Vikings seized back control of York, and it was not finally reconquered until 954. Æthelstan centralised government; he increased control over the production of charters and summoned leading figures from distant areas to his councils. These meetings were also attended by rulers from outside his territory, especially Welsh kings, who thus acknowledged his overlordship. More legal texts survive from his reign than from any other tenth-century English king. They show his concern about widespread robberies, and the threat they posed to social order. His legal reforms built on those of his grandfather, Alfred the Great. 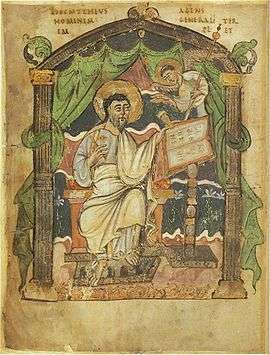 Æthelstan was one of the most pious West Saxon kings, and was known for collecting relics and founding churches. 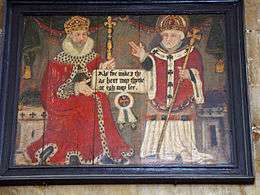 His household was the centre of English learning during his reign, and it laid the foundation for the Benedictine monastic reform later in the century. No other West Saxon king played as important a role in European politics as Æthelstan, and he arranged the marriages of several of his sisters to continental rulers. Little is known of warfare between the English and the Danes over the next few years, but in 909, Edward sent a West Saxon and Mercian army to ravage Northumbria. The following year the Northumbrian Danes attacked Mercia, but suffered a decisive defeat at the Battle of Tettenhall. Æthelred died in 911 and was succeeded as ruler of Mercia by his widow Æthelflæd. Over the next decade Edward and Æthelflæd conquered Viking Mercia and East Anglia. Æthelflæd died in 918 and was briefly succeeded by her daughter Ælfwynn, but in the same year Edward deposed her and took direct control of Mercia. According to William of Malmesbury, Æthelstan was thirty years old when he came to the throne in 924, which would mean that he was born in about 894. He was the oldest son of Edward the Elder and also the tallest. He was Edward's only son by his first consort, Ecgwynn. Very little is known about Ecgwynn, and she is not named in any pre-Conquest source. Medieval chroniclers gave varying descriptions of her rank: one described her as an ignoble consort of inferior birth, while others described her birth as noble. Modern historians also disagree about her status. Simon Keynes and Richard Abels believe that leading figures in Wessex were unwilling to accept Æthelstan as king in 924 partly because his mother had been Edward the Elder's concubine. However, Barbara Yorke and Sarah Foot argue that allegations that Æthelstan was illegitimate were a product of the dispute over the succession, and that there is no reason to doubt that she was Edward's legitimate wife. She may have been related to St Dunstan. Æthelstan's later education was probably at the Mercian court of his aunt and uncle, Æthelflæd and Æthelred, and it is likely that the young prince gained his military training in the Mercian campaigns to conquer the Danelaw. According to a transcript dating from 1304, in 925 Æthelstan gave a charter of privileges to St Oswald's Priory, Gloucester, where his aunt and uncle were buried, "according to a pact of paternal piety which he formerly pledged with Æthelred, ealdorman of the people of the Mercians". When Edward took direct control of Mercia after Æthelflæd's death in 918, Æthelstan may have represented his father's interests there. In 933 Edwin was drowned in a shipwreck in the North Sea. 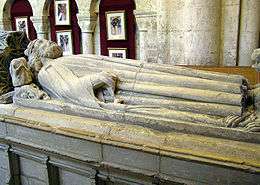 His cousin, Adelolf, Count of Boulogne, took his body for burial at St Bertin Abbey in Saint-Omer. According to the abbey's annalist, Folcuin, who wrongly believed that Edwin had been king, he had fled England "driven by some disturbance in his kingdom". Folcuin stated that Æthelstan sent alms to the abbey for his dead brother and received monks from the abbey graciously when they came to England, although Folcuin did not realise that Æthelstan died before the monks made the journey in 944. The twelfth-century chronicler Symeon of Durham said that Æthelstan ordered Edwin to be drowned, but this is generally dismissed by historians. [lower-alpha 5] Edwin might have fled England after an unsuccessful rebellion against his brother's rule, and his death probably helped put an end to Winchester's opposition. 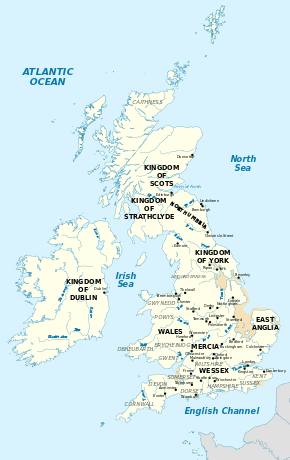 Edward the Elder had conquered the Danish territories in Mercia and East Anglia with the assistance of Æthelflæd and her husband, but when Edward died the Danish king Sihtric still ruled the Viking Kingdom of York (formerly the southern Northumbrian kingdom of Deira). In January 926, Æthelstan arranged for one of his sisters to marry Sihtric. [lower-alpha 6] The two kings agreed not to invade each other's territories or to support each other's enemies. The following year Sihtric died, and Æthelstan seized the chance to invade. [lower-alpha 7] Guthfrith, a cousin of Sihtric, led a fleet from Dublin to try to take the throne, but Æthelstan easily prevailed. He captured York and received the submission of the Danish people. According to a southern chronicler, he "succeeded to the kingdom of the Northumbrians", and it is uncertain whether he had to fight Guthfrith. Southern kings had never ruled the north, and his usurpation was met with outrage by the Northumbrians, who had always resisted southern control. However, at Eamont, near Penrith, on 12 July 927, King Constantine of Scotland, King Hywel Dda of Deheubarth, Ealdred of Bamburgh, and King Owain of Strathclyde (or Morgan ap Owain of Gwent)[lower-alpha 8] accepted Æthelstan's overlordship. His triumph led to seven years of peace in the north. Whereas Æthelstan was the first English king to achieve lordship over northern Britain, he inherited his authority over the Welsh kings from his father and aunt. In the 910s Gwent acknowledged the lordship of Wessex, and Deheubarth and Gwynedd accepted that of Æthelflæd of Mercia; following Edward's takeover of Mercia, they transferred their allegiance to him. According to William of Malmesbury, after the meeting at Eamont Æthelstan summoned the Welsh kings to Hereford, where he imposed a heavy annual tribute and fixed the border between England and Wales in the Hereford area at the River Wye. [lower-alpha 9] The dominant figure in Wales was Hywel Dda of Deheubarth, described by the historian of early medieval Wales Thomas Charles-Edwards as "the firmest ally of the 'emperors of Britain' among all the kings of his day". Welsh kings attended Æthelstan's court between 928 and 935 and witnessed charters at the head of the list of laity (apart from the kings of Scotland and Strathclyde), showing that their position was regarded as superior to that of the other great men present. The alliance produced peace between Wales and England, and within Wales, lasting throughout Æthelstan's reign, though some Welsh resented the status of their rulers as under-kings, as well as the high level of tribute imposed upon them. In Armes Prydein Vawr (The Great Prophecy of Britain), a Welsh poet foresaw the day when the British would rise up against their Saxon oppressors and drive them into the sea. Æthelstan became the first king of all the Anglo-Saxon peoples, and in effect overlord of Britain. [lower-alpha 10] His successes inaugurated what John Maddicott, in his history of the origins of the English Parliament, calls the imperial phase of English kingship between about 925 and 975, when rulers from Wales and Scotland attended the assemblies of English kings and witnessed their charters. Æthelstan tried to reconcile the aristocracy in his new territory of Northumbria to his rule. He lavished gifts on the minsters of Beverley, Chester-le-Street, and York, emphasising his Christianity. He also purchased the vast territory of Amounderness in Lancashire, and gave it to the Archbishop of York, his most important lieutenant in the region. [lower-alpha 11] But he remained a resented outsider, and the northern British kingdoms preferred to ally with the pagan Norse of Dublin. In contrast to his strong control over southern Britain, his position in the north was far more tenuous. In 934 Olaf Guthfrithson succeeded his father Guthfrith as the Norse King of Dublin. The alliance between the Norse and the Scots was cemented by the marriage of Olaf to Constantine's daughter. By August 937 Olaf had defeated his rivals for control of the Viking part of Ireland, and he promptly launched a bid for the former Norse kingdom of York. Individually Olaf and Constantine were too weak to oppose Æthelstan, but together they could hope to challenge the dominance of Wessex. In the autumn they joined with the Strathclyde Britons under Owain to invade England. Medieval campaigning was normally conducted in the summer, and Æthelstan could hardly have expected an invasion on such a large scale so late in the year. He seems to have been slow to react, and an old Latin poem preserved by William of Malmesbury accused him of having "languished in sluggish leisure". The allies plundered English territory while Æthelstan took his time gathering a West Saxon and Mercian army. However, Michael Wood praises his caution, arguing that unlike Harold in 1066, he did not allow himself to be provoked into precipitate action. When he marched north, the Welsh did not join him, and they did not fight on either side. 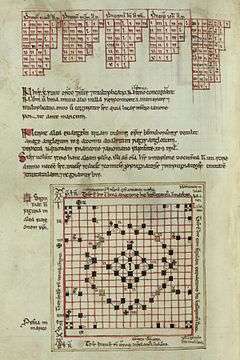 A generation later, the chronicler Æthelweard reported that it was popularly remembered as "the great battle", and it sealed Æthelstan's posthumous reputation as "victorious because of God" (in the words of the homilist Ælfric of Eynsham). The Anglo-Saxon Chronicle abandoned its usual terse style in favour of a heroic poem vaunting the great victory,[lower-alpha 12] employing imperial language to present Æthelstan as ruler of an empire of Britain. The site of the battle is uncertain, however, and over thirty sites have been suggested, with Bromborough on the Wirral the most favoured among historians. ... it would be no small stretch to consider the battle the moment when Englishness came of age. The men who fought and died on that field forged a political map of the future that remains with us today, arguably making the Battle at Brunanburh one of the most significant battles in the long history not just of England but of the whole of the British Isles. More legal texts survive from Æthelstan's reign than from any other tenth-century English king. The earliest appear to be his tithe edict and the "Ordinance on Charities". Four legal codes were adopted at Royal Councils in the early 930s at Grately in Hampshire, Exeter, Faversham in Kent, and Thunderfield in Surrey. Local legal texts survive from London and Kent, and one concerning the 'Dunsæte' on the Welsh border probably also dates to Æthelstan's reign. In the view of the historian of English law, Patrick Wormald, the laws must have been written by Wulfhelm, who succeeded Athelm as Archbishop of Canterbury in 926. [lower-alpha 13] Other historians see Wulfhelm's role as less important, giving the main credit to Æthelstan himself, although the significance placed on the ordeal as an ecclesiastical ritual shows the increased influence of the church. Nicholas Brooks sees the role of the bishops as marking an important stage in the increasing involvement of the church in the making and enforcement of law. After Æthelstan's death, the men of York immediately chose the Viking king of Dublin, Olaf Guthfrithson (or his cousin, Anlaf Cuaran[lower-alpha 14]), as their king, and Anglo-Saxon control of the north, seemingly made safe by the victory of Brunanburh, collapsed. The reigns of Æthelstan's half-brothers Edmund (939–946) and Eadred (946–955) were largely devoted to regaining control. Olaf seized the east midlands, leading to the establishment of a frontier at Watling Street. In 941 Olaf died, and Edmund took back control of the east midlands, and then York in 944. Following Edmund's death York again switched back to Viking control, and it was only when the Northumbrians finally drove out their Norwegian Viking king Eric Bloodaxe in 954 and submitted to Eadred that Anglo-Saxon control of the whole of England was finally restored. In Dumville's view Æthelstan has been seen by historians as a shadowy figure because of an apparent lack of source material, but he argues that the lack is more apparent than real. Charters, law codes, and coins throw considerable light on Æthelstan's government. The scribe known to historians as "Æthelstan A", who was responsible for drafting all charters between 928 and 935, provides very detailed information, including signatories, dates, and locations, illuminating Æthelstan's progress around his realm. "Æthelstan A" may have been Bishop Ælfwine of Lichfield, who was close to the king. By contrast with this extensive source of information, no charters survive from 910 to 924, a gap which historians struggle to explain, and which makes it difficult to assess the degree of continuity in personnel and the operation of government between the reigns of Edward and Æthelstan. Historians are also paying increasing attention to less conventional sources, such as contemporary poetry in his praise and manuscripts associated with his name. Æthelstan's reputation was at its height when he died. According to Sarah Foot, "He found acclaim in his own day not only as a successful military leader and effective monarch but also as a man of devotion, committed to the promotion of religion and the patronage of learning." Later in the century, Æthelweard praised him as a very mighty king worthy of honour, and Æthelred the Unready, who named his eight sons after his predecessors, put Æthelstan first as the name of his eldest son. 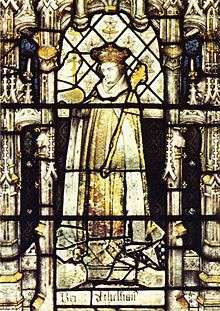 Memory of Æthelstan then declined until it was revived by William of Malmesbury, who took a special interest in him as the one king who had chosen to be buried in his own house. William's account kept his memory alive, and he was praised by other medieval chroniclers. In the early sixteenth century William Tyndale justified his English translation of the Bible by stating that he had read that King Æthelstan had caused the Holy Scriptures to be translated into Anglo-Saxon. ↑ An allusion in the twelfth-century Liber Eliensis to "Eadgyth, daughter of king Æthelstan" is probably a mistaken reference to his sister. ↑ An exception is George Molyneaux, who states that "There are, however, grounds to suspect that Æthelstan may have had a hand in the death of Ælfweard's full brother Edwin in 933". ↑ Historians generally describe her as his only full sister, but Maggie Bailey points out that this rests on the late testimony of William of Malmesbury, and the Anglo-Saxon Chronicle makes no such distinction when recording her marriage to Sihtric. William did not know her name, but traditions first recorded at Bury in the early twelfth century identify her as Saint Edith of Polesworth. This is considered uncertain, but it is likely that she entered a nunnery in widowhood. ↑ Some historians believe that Sihtric renounced his wife soon after the marriage and reverted to paganism, while others merely state that Æthelstan took advantage of Sihtric's death to invade. In the view of Alex Woolf, it is unlikely that Sihtric repudiated her because Æthelstan would almost certainly have declared war on him. ↑ According to William of Malmesbury it was Owain of Strathclyde who was present at Eamont, but the Anglo-Saxon Chronicle says Owain of Gwent. It could have been both. ↑ William of Malmesbury's report of the Hereford meeting is not mentioned in the first volume of the Oxford History of Wales, Wales and the Britons 350–1064 by Thomas Charles-Edwards. ↑ The situation in northern Northumbria, however, is unclear. In the view of Ann Williams, the submission of Ealdred of Bamburgh was probably nominal, and it is likely that he acknowledged Constantine as his lord, but Alex Woolf sees Ealdred as a semi-independent ruler acknowledging West Saxon authority, like Æthelred of Mercia a generation earlier. ↑ In the view of Janet Nelson, Æthelstan had limited control over the north-west, and the donation of Amounderness in an area which had recently attracted many Scandinavian immigrants to "a powerful, but far from reliable, local potentate" was "a political gesture rather than a sign of prior control." ↑ The Battle of Brunanburh: A Casebook includes two versions of the poem and translations by Michael Livingston and Robert P. Creed, and Alex Woolf gives his own translation in From Pictland to Alba. ↑ Wormald discusses the codes in detail in The Making of English Law. ↑ David Dumville's chapter on Æthelstan in Wessex and England is headed 'Between Alfred the Great and Edgar the Peacemaker: Æthelstan, The First King of England', and the title of Sarah Foot's biography is Æthelstan: The First King of England. ↑ "History by the Month: September and the Coronation of Æthelstan'". Parker Library, Corpus Christi College, Cambridge. 8 September 2015. Retrieved 6 April 2016. 1 2 Miller, "Edward the Elder"
1 2 Foot, "Æthelstan (Athelstan) (893/4–939), king of England"
↑ Williams, "Ælfflæd"; Miller, "Edward the Elder"
↑ Foot, Æthelstan: The First King of England, p. 18; Stenton, Anglo-Saxon England, p. 340; Miller, "Æthelstan"
↑ Foot, Æthelstan: The First King of England, pp. 88–89; Woolf, From Pictland to Alba, pp. 166–168. ↑ John, "The Age of Edgar", p. 172; Stafford, "Ealdorman"
↑ Lapidge, "Dunstan"; Yorke, "Æthelwold"
↑ Cubitt & Costambeys, "Oda"
↑ Foot, Æthelstan: The First King of England, pp. xvi, 48–52; Ortenberg, "The King from Overseas", pp. 231–232; Nelson, "Rulers and government", p. 112; Wormald, "Æthelweard"
↑ Foot, Æthelstan: The First King of England, pp. 251–258, discussing an unpublished essay by Michael Wood. 1 2 3 Williams, "Athelstan"
↑ Wood, "Aethelstan: The First King of England"
Foot, Sarah (2007). "Where English Becomes British: Rethinking Contexts for Brunanburh". In Barrow, Julia; Wareham eds, Andrew. Myth, Rulership, Church and Charters. Ashgate. pp. 127–144. ISBN 978-0-7546-5120-8. Wikimedia Commons has media related to Æthelstan.